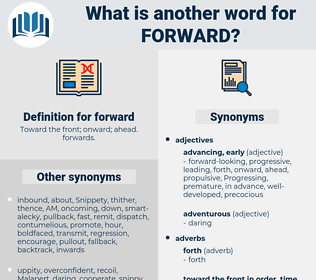 What is another word for forward? Toward the front; onward; ahead. forwards. forward-thinking, downstream, later, leading-edge, cutting-edge. developments, offers, frontiers, STRIDES, estimates, levels, releases, Gives. eagerly, impatiently, Prospectively, anxiously, enthusiastically, proposals, beforehand, furthermore, Recommendations, far, farther, up, downstream, later, development, afterwards. welcomed, dropped, Filed, disclosed, Issued, Referred, relayed, mailed, dispatched, Achieved, conveyed, Reached, Passed, Returned, Communicated. Transferring, Transporting, Delivering, flowing, Distributing, disclosing, issuing, Referring, directing, sharing, Relaying, imparting, spreading, mailing, Carrying, conveying, Channeling, passing, releasing, instilling, getting. follows, receives, sends, communicates, conveys, passes, gets, transmits. meek, past, last, reserved, later, shy, Reversing, back, timid, backward. improvident, rude, unripened, myopic, fusty, underdeveloped, antediluvian, old fashioned, savage, out-of-date, green, germinal, subsequent, heedless, hoary, outworn, immature, careless, mousy, rudimentary, primordial, unassertive, hindmost, early, passe, succeeding, old-time, following, antique, nonprogressive, undeveloped, latter, old, low, musty, primitive, dated, incautious, underweight, oldfangled, half-baked, antiquated, timorous, concluding, unripe, undersized, lower, primeval, consequent, shortsighted, obsolete, uncivilized, uneducated, embryonic, hind, dorsal. check, hold, keep, discourage, oppose, rest, delay, slow, dissuade, block, impede, halt, neglect, hinder, maintain, procrastinate, decrease, hurt, cease, obstruct, stop, refuse, ignore, thwart. There was such a crowd there that it was not possible to move forward or back. I look forward with much pleasure to making my aunt Dall known to you.